Mifflin County Farm Bureau held its monthly meeting Feb. 28. Tim Goss gave an update on the membership drive. Five new members were approved. Mifflin County Rural Road Safety event has been set for 10:30 a.m. until 1 p.m. April 14 at Steven Byler’s Penn Canal Farms 340 Apple House Road in Belleville. Our speaker will be from Nationwide Insurance. Light refreshments will be available. We will have a “Measure the Candidates” night at 7 p.m. May 2 at the Mifflin County High School, Lewistown. There are a number of candidates for Adam Harris’ seat so we should have a good turn out. Measure the Candidates is open to the general public so we hope to see lots of you there. It is time to be thinking about developing Policy resolutions for 2018. If you have ideas for a policy, please contact Ernie Harrop at (717) 437-3448 or email eaharrop80@gmail.com. The Farmers Care event at Hershey Ronald McDonald House scheduled for Feb. 7 was rescheduled to Feb. 21. due to weather conditions. It was a successful event with over $16,000 raised in cash, gift cards, items, magazines for recycling and soda tabs from Cumberland, Franklin, Fulton, Huntingdon, Juniata, Lebanon, Mifflin, Perry and Schulkill/Carbon counties. Adams and Lancaster counties will be making contributions in March. Those amounts will be added to our total. Thank you to everyone who made this such a great event! The State Women’s committee has released information for the 2018 Safety Contest. This year’s theme is “Think Safe, Be Safe.” The Safety Coloring Page Contest is open to any youth ages 4 to 6 years old. The contest is not limited to children or grandchildren of Farm Bureau members, but the child must be a Pennsylvania resident. The Safety Poster Drawing Contest is open to any youth ages 7 to 12 years old. The contest is not limited to children or grandchildren of Farm Bureau members, but the child must be a Pennsylvania resident. The Safety Photo Contest is open to any youth 13 to 18 years old. 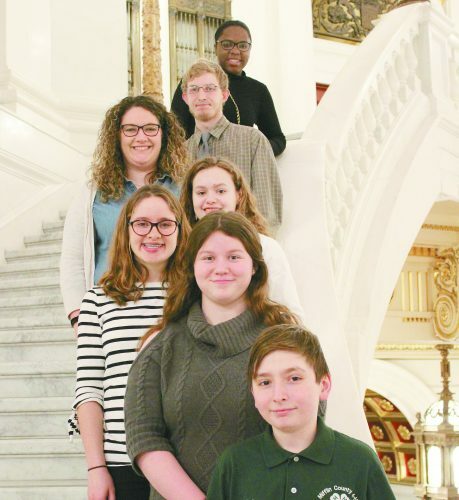 The contest is not limited to children or grandchildren of Farm Bureau members, but the teen must be a Pennsylvania resident. Contact Sonieta Harrop at (717) 437-5818 or Mifflin County Farm Bureau president Tim Goss for a coloring page and complete list of all rules for the contest. The deadline to submit entries to Mifflin County Farm Bureau is May 1. The 2018 Outstanding Woman in Agriculture Award applications is also now available. If you know a woman who is a Farm Bureau member who has shown dedication to and positively contributing to Agriculture through hard work, perseverance, and creativity, please consider nominating her for this award. Contact Sonieta Harrop at (717) 437-5818 or Mifflin County Farm Bureau president Tim Goss for an application. Deadline to submit an application to Mifflin County is July 1. Our spring meeting will be held March 28 at the Milroy Presbyterian Church. A punch bowl will be available at 6:15 p.m. with the meal to begin at 6:45 p.m. Menu will include lettuce with cream dressing, roast pork loin, mashed potatoes with gravy, corn, green beans with cheese sauce, applesauce, roll with butter, assorted desserts and beverages. Cost is $12 for adults, children 6-12 $5 and 5 and younger free. Reservations are due March 20 and can be made by calling Sonieta Harrop at (717) 437-5818 or email slharrop61@gmail.com. A program on Farm Crisis Preparedness will be presented with materials provided for you to implement a plan on your own farm. The YF&R committee is also requesting you please bring at least one canned food item for the Young Farmers & Ranchers Harvest for All Campaign. All Farm Bureau members are invited to attend.